"With women's hockey so big these days, that just seems silly to me," said one player on the Toronto Furies. Professional hockey players are calling foul on baby clothes sold at the Hockey Hall of Fame in Toronto that they say reinforce outdated gender stereotypes. The outfits for infants up to nine months old come in two colour schemes: blue and pink. The blue pajamas are emblazoned with the phrase "future hockey legend." The pink ensemble, which costs $2 more before taxes, reads "Cutie" and comes fitted with a tutu. Both versions are marketed to fans of various franchises. Players on the Toronto Furies, the city's professional women's hockey team, said Saturday that the items for sale at an iconic temple of the sport are disappointing but not surprising. "Who's to say that a little girl can't be a hockey star? Why can a girl only wear the tutu, and the boy gets to be a future hockey legend?" said defender Shannon Moulson-Nap. "With women's hockey so big these days, that just seems silly to me," she added. 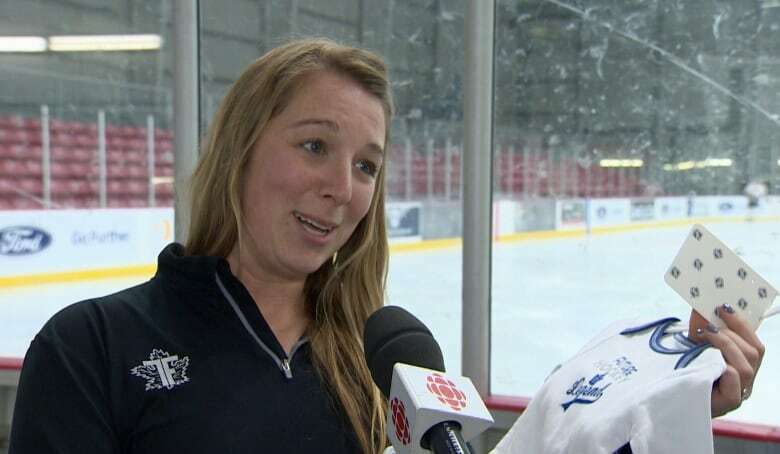 Forward Carolyne Prévost has played in the Canadian Women's Hockey League for seven years and also teaches high school. She said it's dismaying to have institutions continue to perpetuate gender roles amid broader societal changes. "As a teacher, the message I send to girl is to be strong, to have confidence in oneself and to really break these stereotypes," she told Radio-Canada. "So to see clothes that represent cliches about woman is frustrating." In a brief email statement, a spokesperson for the Hockey Hall of Fame said the products are licensed by the National Hockey League on behalf of its member franchises, and they are distributed by a subsidiary of Reebok. Kelly Masse said the Hockey Hall of Fame has not received any complaints from the public about the outfits. "We have no further comment," the statement read. Requests for comment from the NHL were not immediately returned. The Hockey Hall of Fame itself has increasingly spotlighted the sport's most accomplished female players in recent years. Six women have been inducted, including current CWHL commissioner Jayna Hefford, who earned the honour last November. Players on the Furies said the increasing prominence of women's hockey, and its most celebrated stars and coaches, should be reflected in the clothing sold at the Hall of Fame. "With everything that's been changing lately, why are [we] still doing this girls versus boys thing?" said Moulson-Nap. "Let's get with the times here."